What Is The Purpose of an Electrical Breaker Box? The breaker box's breakers are installed on day 64, with circuits connecting to all parts of the house. Our breaker box, by Square D, has a thin profile that mounted easily between the wall studs and flush into the wall of the garage. All of the circuit breakers are well marked and the main breaker is easily accessible. The electrical meter is directly on the other side of the wall from the break box. On the other end of the wire, the outlets and light switches and wired according to plan, mounted and cover plates are put in place. Each gang box was previously roughed in during framing, with the electricians pre-stripping the wires and cutting them to length. This small step saved quite a bit of time for the follow up electricians when the finished wiring was completed. Topics about electricity are commonly left to the reliable expertise of engineers and electricians. However, for homeowners, whether new or old, it wouldn't hurt to have even just a basic understanding of what it is and how it works in relation to a household. Although general electricians will always be around, they are constantly in demand, and at times with exorbitant rates, also it might not be easy to get one immediately. Perhaps, with a little know how of electricity you can solve the problem yourself. To gain basic knowledge of how electricity works around the house, it is necessary to understand how it gets from the source or provider to the house. There are three main requirements for this to take place - an electric company that supplies the electricity, an electric meter through which the electricity supplied by the electric company passes, and the electric breaker box which is the center of everything electricity-related in the household. A typical question of a novice would be exactly what is the purpose of an electrical breaker box? In the simplest terms possible, an electrical breaker box is the "catcher" of the electricity provided by the electric company. As its name, electrical breaker box, implies, it breaks the current being supplied by the electric company into manageable doses. It is essential in a household because it regulates the electricity loaded to each and every electronic device used in any home. When a TV, radio, computer, microwave, refrigerator, or any other appliance or electronic equipment is turned on, the electrical breaker box ensures that the right amount of voltage is supplied to that particular item. Without it, direct and unregulated currents will definitely damage, if not blast the appliance being used into smithereens. As such, it is a must for homeowners to know the capacity of their electrical breaker box. Around 1950s, the capacity of an electrical breaker box, which was then called a fuse box, was 30 Amps. Years later, as more electronic equipment was invented, it was increased to 60 Amps. Nowadays, the minimum capacity of an electrical breaker box required for a regular household is 100 Amps. For bigger homes, the capacity is increased to 200 Amps as, understandably; a bigger house may contain more appliances or electronic equipment. The electrical breaker box's components have also changed from the way they were built back then. In the old days when an electrical breaker box was still called a fuse box, it was composed of fuses, cartridges, fuse holders, panels, disconnects, and a metal casing. These days, the same components are present, but are all enhanced to accommodate a more sophisticated requirement. 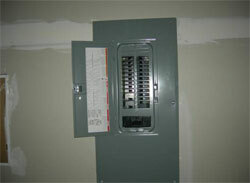 Most electrical breaker boxes are installed in garages or basements, especially in old houses. Practicality dictates that they are installed outside near the electric meter. This will ensure that in instances of fire or flood, the electrical breaker box is accessible and can be turned off easily. Completely understanding the complexities of electricity and its mechanisms certainly takes time. After all, didn't engineers and electricians spend a considerable amount of time gaining mastery over their respective fields? Acquiring basic knowledge about the electrical system becomes fundamental - fundamental to safety and security, and consequently, peace of mind. Knowledge at this day and age is available everywhere - a walk or ride away if we are near a library; a fingertip away if we are talking about the internet. Talking to electricians or engineers who are willing to share a tip or trick is also another option. No matter how knowledge is acquired, what is important is that you gain some useful advice and knowledge about the electricity used in your home.